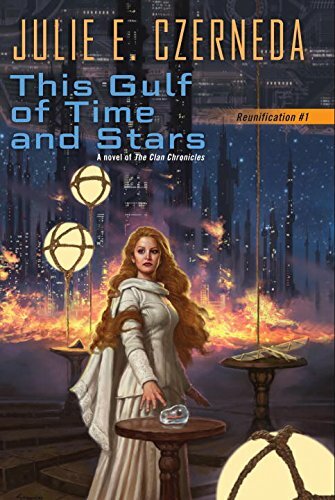 This Gulf of Time and Stars is a rich space opera drama grounded in human (and near-human) personal lives, so it's always exciting and never abstract. Book one of the Reunification Trilogy, it's actually book seven of the Clan Chronicles. It's full of characters that have appeared previously, but it's a good jumping-on point for the series. Everyone is introduced and serves a defined purpose as if this is any other first book in a series and balances the newness of this new story well with the established characters. Whatever you need to know, as a new reader, is talked about or explained. This makes reading This Gulf of Time and Stars easy, and builds a good argument for getting into the previous two trilogies, too. This book concerns the Clan, a minority of telepathic aliens passing as humans spread thinly through Trade Pact Space—the section of the galaxy shared by humans and hundreds of other species. In previous books, one of the Clan attacked humans, and this trilogy is kicked off by the revenge that lowers Clan numbers from almost a thousand to less than two hundred in just a few chapters. They can't fight back, so they flee—and try to find their way back to the original home world of their people, which has been lost to time. The book is set in a detailed and fascinating universe where humans are only one of many species, and not the purveyors of the main point of view. That honor goes to Sira di Sarc, who looks human but has stopped trying to pretend she is one. She thinks and acts according to her own culture and biology, but is married to a human and so is one of very few of her xenophobic kind who appreciates them. The story trades chapters between her point of view in first person, with the extra layers of non-physical knowledge and communication that come with being a telepath, and her human husband's point of view in third person. Between them, they weave a complex story with many moving parts that somehow never gets overloaded or confusing. Probably because the two of them stay pretty close to the middle of every major event and have more agency than most. There is politics and intrigue, but this is not a political thriller. There are space ships, space stations, alien worlds, and several encounters with aliens and their cultures. There's a mystery that doesn't drag on but strikes the perfect balance between a good clip and savoring the details, without moving too fast. This is a true space opera, with all the scale and scope and epic world-changing plotlines such a story needs. There are a lot of characters, but they all have defined personalities and purposes in the story. Czerneda seems to have a flare for developing aliens who feel alien, but who are some of the most likable characters in the book, too. And over it all, This Gulf of Time and Stars is a story about bringing people together. Almost everyone in here is connected to the others by familial bonds, either the ones they're born to or the ones they've built themselves. Whatever happened in the previous books and in the characters' pasts created rifts, and this book starts closing those gaps—all while sending everyone in new directions that open up new sections of space to tell stories in. It's exciting, moving, and often beautifully written, displaying an inventive imagination and a surety of storytelling that makes even the stranger points flow without breaking the suspension of disbelief required of the genre. And despite its complexity, it's a fast and engaging read. There is always something new and interesting happening to these characters. This Gulf of Time and Stars sets up very nicely for the next book, which promises, from this one, to be new and fascinating, too.